Improve the "Business of IT" by using a measurement framework and metrics that matter most. Metrics are important to management. What's not measured cannot be managed. But what should be measured, why and how? Metrics validate your IT strategy and vision; provide direction with targets and metrics; justify changes with a means to gauge value-realized; signal when to intervene with corrective actions. Hear case studies and examples that help you improve alignment, meet compliance and drive service excellence. 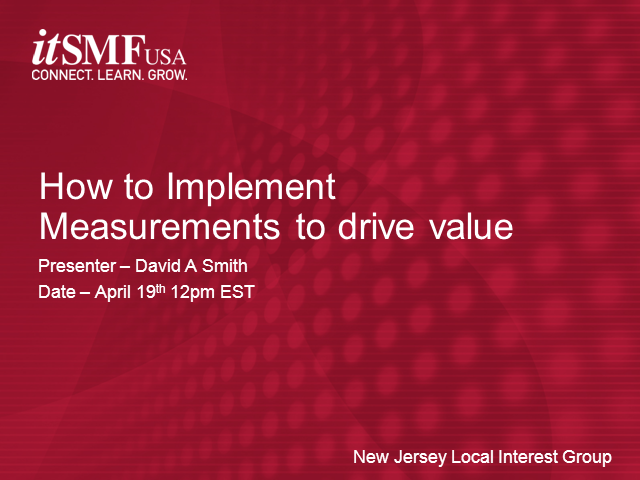 Learn the secrets of how measurement frameworks work and take away a roadmap with actionable steps. Let's get IT started. David Smith is the President of Micromationinc.com, an IT Consultancy that specializes in IT service optimization. David is also a certified TCO Expert, ITSM Expert and ISO 20000 Consultant. He has 30+ years experience in managing and improving the quality, efficiency and effectiveness of IT service delivery for commercial IT vendors as well as the internal IT organizations of well-known private and public sector companies. David's IT consulting kit-bag includes tools, methods and lessons-learned for: measurement frameworks, metrics, optimization, governance, portfolios, scorecarding, benchmarking, baselining, service & process improvement, KPI designer SW, ROI, TCO, ABC, ABM, technology refresh, support modelling, service marketing, cataloguing and pricing using industry best practices like ITIL, CobiT, CMMI etc. David is the author of “Implementing Metrics for IT Service Management” ISBN: 9789087531140 and contributing co-author of "IT Service Management - Global Best Practices" ISBN: 9789087531003.